Two years ago, the U.S. Air Force brought the stealthy RQ-170 Sentinel drone and the Massive Ordnance Penetrator—two of America’s most secretive weapons—together for a single test. 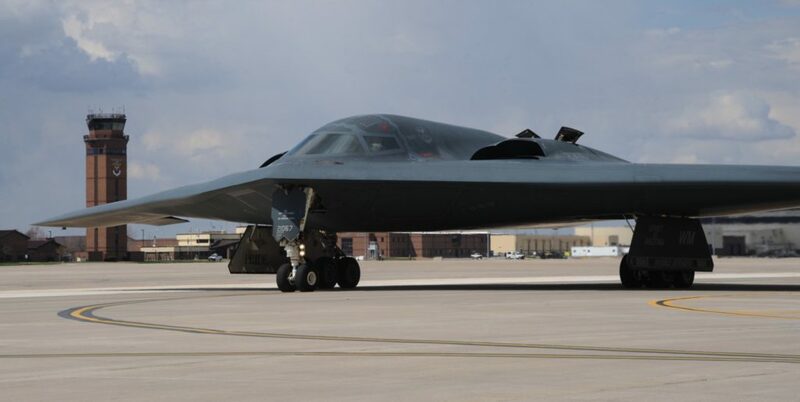 The Pentagon denies that it intends the huge MOP munition—which only the B-2 stealth bomber carries and which can punch deep into the ground to destroy underground bunkers—for use against any particular countries. But the experimental pairing in 2012 could have been a sort of rehearsal for potential strikes in the Middle East—strikes against targets too heavily-fortified and too well-defended for all but the stealthiest attackers with the most powerful bombs. Technically, the primary goal of the flight test from two years ago was to see if fixes to the 15-ton MOP—“including tail fin modifications and … a second fuze”—worked as expected, an official budget document explains. As part of the October 2012 trial run at New Mexico’s White Sands Missile Range, one of the Air Force’s bat-wing RQ-170s assessed the damage from the MOP drop, according to a heavily redacted historical document War Is Boring obtained through the Freedom of Information Act. A B-2—a kind of larger, manned cousin of the RQ-170—released one of the precious few MOPs over the range to start off the practice run, which bore the code name QFT-6. We don’t know whether the unmanned spy circled the area during the strike or flew in later to film the aftermath. Lockheed Martin built the Air Force’s fleet of roughly 30 Sentinels in the early 2000s. The super-secret aircraft belong to the 30th Reconnaissance Squadron at Creech Air Force Base in Nevada—a major drone hub. The Pentagon has published few details about the squadron’s missions. But the RQ-170—informally known as the “Wraith”—was clearly an important part of the mock attack mission in 2012. The day before the bomb test, Air Force’s Air Combat Command briefed officials about the RQ-170’s place in the concept of operations, or CONOP, the footnotes in the flying branch’s history indicate. A CONOP document outlines the basic plan and ultimate goals of a mission. After the QFT-6 flight, the Air Force invited certain military brass to attend additional briefings about the Wraith’s role, according to the history. The attendees included representatives from around the Air Force, as well as from the Defense Intelligence Agency’s obscure Underground Facility Analysis Center. But more importantly, personnel from Central Command and the Air Force’s headquarters for operations in the Middle East were also present, as indicated by a table entitled “MOP Testing Stakeholders.” None of the Pentagon’s other regional commands were present. Countries such as Syria and Iran might have provided the inspiration for the experiment’s “threat-representative [practice] targets,” the Pentagon’s head weapons-tester explained in a 2012 report. This makes sense, as the Syrian civil war had just begun when the Air Force first began planning the test. The U.S. and other countries were worried that Damascus might use chemical weapons against civilians—or that Islamist rebels might capture the deadly agents. For a brief moment, the Pentagon seemed poised to launch air strikes against Syria’s chemical arsenal. The Air Force’s B-2s could have skirted the country’s air defenses to deliver the initial blow. The RQ-17os could have followed behind to assess the results. But Syrian president Bashar Al Assad had cut a deal to destroy his stockpile of poisons months before the trial bombing run took place. The stealth armada never deployed over Damascus. CENTCOM and the Air Force were probably more interested in what the bomber-drone pairing could do against Iran. Despite preferring to negotiate, Washington continues to hold out the threat of air attacks on the Islamic republic’s controversial nuclear program. The radar-evading Sentinels have been keeping tabs on Tehran’s subterranean enrichment and storage sites for at least five years now. The Air Force has deployed the drones from bases in Afghanistan and the United Arab Emirates. The year before the MOP practice run, one of the unmanned spies crashed along the Iran-Pakistan border and promptly fell into Iranian hands—possibly giving up its secrets. But given Iran’s dense air defenses, the radar-evading Wraith is probably still the Air Force’s first choice for checking out the impact of any attack. Likewise, the flying branch has only ever modified the elusive B-2s to carry the giant MOP bombs. Washington now has “confidence going forward that Iran doesn’t have the capacity to develop a nuclear weapon,” Pres. Barack Obama told reporters recently. But if that changes, the Air Force’s stealth bombers and drones are ready to drop giant bombs.